These are heavy-duty alternatives to those flimsy string trimmers most people have in their backyard shed or garage. They’re much better suited to handling thick brush than traditional trimmers. In the article below, we’ve taken a detailed look at the best brush cutters on the market today. Before we get into the individual brush cutter reviews though, we’ve put together a buying guide that will walk you through what you need to look for. The machines we review have some great qualities, but they’re not perfect. If there’s something about them we don’t like, we’ll talk about that too. When isn’t a String Trimmer Good Enough? Do I Need Gas Power? Does it Make a Difference if It’s 2 Stroke or 4 Stroke? Is a Straight Shaft Better? Do I Need a Changeable Head? Can I Handle the Vibration? The basic string trimmers you buy at the local hardware store for $30 or $40 are fine if you have a relatively small and flat yard. For everyone else they’re not really up to the job. Their power is limited and they easily become bogged down in heavy growth underbrush. I’ve burnt more than one motor out this way. The cheap nylon string they use also tends to break every few minutes. A true brush cutter is much more durable than a string trimmer. They tend to use a thicker nylon line as well that can stand up to punishment, or in many cases a steel blade. They are more expensive, but the engine on these machines is designed to handle a harder workload than it’s string trimmer cousin. If you have a major weed problem you need a brush cutter. These days there is always a choice between gas or electric when it comes to outdoor power tools. Is one better than the other? It depends what you’re using it for. There’s no question a gasoline powered engine on anything will give you more power, but do you need that extra power? In many cases an electric model will give you all the power you need. When it comes to electric trimmers you have two choices – corded versions and battery powered cordless ones. Battery powered technology has come a long way in the last few years, but it can still be unpredictable. If you have your heart set on an electric model, I would recommend sticking with the corded version so that you always have reliable power when you need it. All arguments about the environment aside, the gas powered brush cutter is clearly the best choice. As long as you have a tank of gas with you, it can be used anywhere. It always gives you the same powerful trimming capability and it doesn’t need a wall outlet or a battery charger. You just add gas and away you go. Gasoline powered engines are more powerful and you can cut through thicker brush. Deciding on whether to opt for a 2 stroke or 4 stroke gasoline powered engine is a little more complicated. A 4 stroke will give you more power, but it also weighs more which makes it more demanding on the body. It also has more moving parts so it requires more maintenance and tends to breakdown easier. With a 2 stroke engine you may be sacrificing a little power, but in most cases it’s more than up to the job. Unless you’re sure you need every ounce of power you can find, the 2 stroke engine is a better choice. They’re typically more affordable and they don’t have as many maintenance issues. You’ve probably seen many different designs on trimmers and brush cutters. Some have straight handles and some have curved handles. Does it make a difference which one you choose? The curved handle trimmers may be more ergonomic and they do make it easier to get into some tough spots, but that comes at a price. The power to the blades is run through that shaft. The bend in the shaft effects the power distribution, but more importantly it also makes these machines more susceptible to breakdowns. In our opinion, a straight handled trimmer is the better choice because of this, but there are many curved handle trimmers that do a great job. It probably shouldn’t be a make or break factor in your purchase decision. When you buy one of those cheap string trimmers at the local department store you’re stuck with one option – a blade that cuts using a thin, cheap, nylon cord. 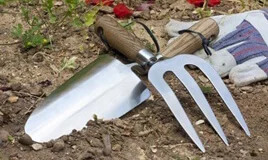 A good brush trimmer will often have changeable heads allowing you to switch between using nylon cord and a steel blade depending on the situation. This versatility makes them more useful and can save you some money in the long run. You won’t need to have two different tools. All you have to do is change the head. The best models have a quick change head that makes the task of changing heads easy. Trimming a large yard can be a time consuming job. You want a machine that feels comfortable to hold. Some have a looped handle and others have a two bar design. The best advice is to try holding a few different types to see which one is most comfortable for you. A good brush cutter can be heavy – especially after wielding it for an hour. Comfort is an important factor in your purchase decision. Another major factor when it comes to the comfort of the operator is the amount of vibration the machine produces. The best hand held brush cutters have built in anti-vibration technology that minimizes the effects on the body. The engines on good models are also designed to run smoothly and produce very little vibration to begin with. The Husqvarna 336FR is a versatile brush cutter with decent power in the form of a 34.6 cc engine. When you’re ready to move up from a simple trimmer this is a good choice. Those tough overgrown weeds around that old tree in your backyard won’t stand a chance. The engine also uses X-Torq technology which gets the most out of a smaller engine and gives you great fuel economy as well. This is a 3 in 1 model that gives you plenty of lawn care options. This is one of the best gasoline powered lawn tools on the market. It comes equipped with a trimmer head, a grass cutting blade, and a saw blade for heavy brush. This machine will cut just about anything smaller than a tree. The 336FR also comes equipped with an ergonomic harness that does a great job of shifting the weight of the machine evenly. A gas powered brush cutter is a heavy piece of equipment, so a good harness is essential if you don’t want to wear out as you go. Some manufacturers seem to forget that we come in all different shapes and sizes, but not Husqvarna. The handle on this machine is fully adjustable to your own preference. You won’t have to worry about bending over at weird angles or throwing you back out because of it. All you have to do is set the handle at a comfortable length and you’re ready to tackle the weeds. There are also some built in safety features to protect you from flying debris. The cutting guard has been designed to work effectively no matter which attachment you’re using. It’s still a good idea to use safety glasses when operation any piece of equipment like this, but the guard will block most debris before it gets near your eyes. There aren’t really too many negatives with this machine. The price is a little steep at more than $500 dollars, but it is a quality machine. Most customers have nothing but positive experiences with this machine, but there have some complaints about the level of customer service if you do have a problem. This model also comes with a 2-year warranty. Overall the Husqvarna 336FR is a powerful and versatile machine. It’s ergonomic design makes it easy on the body and the multiple heads allow you to use it in many different situations. If you don’t mind spending a little extra this is one of the best brush cutters on the market. There are some good bus in the brush cutter category that probably don’t qualify as household names and the Iglobalbuy 52cc 5 in 1 machine is one example. This is a great machine with some impressive features. It has a powerful 52 cc engine with a 2 stroke design with reliable performance. The Iglobalbuy 52cc brush cutter also happens to be one of the more affordable options on the market at just under $200. The versatility of this machine is another great feature. It’s 5 different machines in one making it one of the best brush cutters for the money. This machine is a grass trimmer, brush cutter, hedge trimmer, pole saw, and chain saw all rolled into one. There aren’t too many outdoor chores it can’t help you with. This is a gasoline-powered model so it does have a bit of weight to it, but the straight handled design is thin and sleek to make it easier to work with. The handgrip that you control the machine with is one of the shortcomings of this machine though – it’s not the most ergonomic design. Another minor issue with this machine is that you can feel a bit of vibration when you use it. That will add a bit of wear and tear on the body after prolonged use. Overall though it’s a pretty good machine for the price. The Iglobalbuy 52cc 5 in 1 lawn tool is a good brush cutter for the money. The fact that you get 5 different tools in one is a good sales feature. It’s not the best machine on the market, but it gets the job done. You do get a 2 year warranty as well. The Proyama Extreme Duty 2-Cycle Dual Line Brush Cutter is another option when it comes to affordable brush cutters. At 42.7 cc’s it’s not the most powerful cutter under $200, but it does have more than enough power to do the job. If you have a serious weed problem in your backyard this machine will take care of it. It has an easy starter feature that is a welcome addition on a gasoline powered engine. There are more versatile machines on the market that operate as several different tools, but this offering from Proyama does come equipped with a changeable head that allows you to switch between a string nylon cutting head and a toothed cutting blade. It’s perfect for trimming the grass or chopping through some dense underbrush. One of the most unique features of this machine is also one of its most controversial. It has a bicycle style handlebar design that will feel awkward to some, but does make it relatively easy to maneuver. There’s also a double body harness included in the package that does help. On the positive side, Proyama has tried to include everything you need to use this machine right out of the box. It ships with safety gloves, goggles, and ear muffs to protect your hearing. When it comes to safety this machine has you covered. The Proyama Extreme Duty 2-Cycle Dual Line is a good machine if you’re on a budget. It’s a relatively no frills machine, but it’s a capable machine. If you’re just looking for a brush cutter and you’re not concerned about all the bells and whistles this machine is one to consider. There are always one or two products that stand out a bit from their competition. For a relatively affordable machine at well under $300, the Chikura Multi Powerful 52 cc Brush Cutter is one of those products. It’s a gasoline powered model with a 52 cc engine that’s more than enough for most backyard cutting jobs. At about 28 pounds it’s relatively lightweight for a gasoline powered cutter that makes it ideal for most home owners. This Chikura brush cutter has a range of different functions including a grass trimmer function, weeding capability, and saw blades for cutting through small branches. The blades that ship with the machine are a little on the flimsy side, but it does work well with higher quality third party blades as well. It’s easily one of the best hand held brush cutters if you don’t want to spend a small fortune. There are other brush cutters available with a handlebar design, but this cutter is one of the better ones. The grip is relatively narrow, making it more comfortable than other products in the category. The body harness is included and you will need to use it while you work as it does weigh close to thirty pounds. The Chikura Multi does have its limitations. This is not the safest model in the brush cutter family. It does come with a shield that can be used when you’re using the string trimmer function, but it doesn’t work with the blades. You’ll definitely have to have your safety goggles on when using this machine for heavy duty work. The Chikura Multi Powerful 52 cc Brush Cutter is a competitive product at an affordable price. It’s compact handlebar design makes it easy to work with and that’s positive. The blades it comes with aren’t the best quality and it is lacking a debris shield for the blades. It’s still a good option if you’re looking for a multi-function brush cutter under $300. The Blue Max 52623 Extreme Duty 2-Cycle Dual Line Trimmer and Brush Cutter is one of the most popular models in circulation for a couple of reasons. It’s got an affordable price tag at well under $200 and it’s a quality machine. It’s also extremely light weight compared to some of it’s competitors at 17 pounds. For a gasoline powered brush cutter that’s impressive. Even with a harness to support a cutter, it can still wear you out after a couple hours of use. That’s not an issue with this machine. The functionality on this machine is relatively basic. It’s meant to be used for trimming your grass and cutting larger weeds. It’s not an all in one machine like some others on the market. Having said that, it does do a great job of taking care of weeds. The Blue Max has a straight handle design, with a narrow handle bar. The handlebars are also cushioned with anti-vibe technology for extra comfort. Once it’s strapped onto your back using the included harness you’ll hardly notice its weight at all. It’s a popular model for both home and commercial use. There are a couple of concerns with this machine though. The recoil start can be inconsistent, making it difficult to start up from time to time. It’s also can get bogged down after extended use. It’s great for small quick jobs, but it may not be the best brush cutter for extended use. While the Blue Max 52623 is a popular model for both home and commercial use, in our opinion it’s best for homeowners. 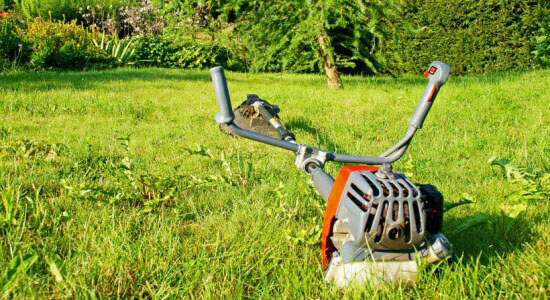 It’s great for small backyard jobs, but it gets bogged down after extensive use. It’s the perfect entry level brush cutter, you just can’t overuse it. There are some companies that are known for their quality and reliable lawn equipment and Troy Bilt is one of them. Their TB42 BC 27 cc is a reliable little machine that’s priced competitively. It is only a 27 cc engine so it’s not ideal for heavy-duty work, but it’s perfect for the homeowner that needs more than a simple string trimmer. The nice thing about this machine is that it has a technology called JumpStart that allows you to start it quickly and easily without having to pull on a recoil line. It will save your shoulder from a lot of punishment. It only weighs about 14 pounds as well making it one of the lightest options available in the brush cutter category. It has a straight shaft with a J handle design that isn’t really the most comfortable configuration. You can switch it to either side depending in your preference, but a dual handle is a better option so this was a little disappointing. This Troy Bilt cutter does ship with the strap included and it has a decent cutting width of about 18 inches. Switching blades is relatively straightforward and the machine does hold up well to wear and tear. It comes standard with a 2 year warranty. It isn’t all good news with this machine though. This cutter can be difficult to start at times, especially after not using it for a while. If you’re trying to cut a dense, moist area, the machine may have a difficult time. It’s best used in dry conditions otherwise it’s known to bog down. The JumpStart feature on this Troy Bilt cutter is great when it works, but it can be unreliable. It’s also not ideal for use in wet conditions. If you’re looking to upgrade from a basic trimmer without spending too much money this is a step up. It does have a 2 year warranty as well. If you find yourself going through a lot of string when using your traditional weed trimmer it may be time to consider a brush cutter. These machines come equipped with the option of attaching a steel blade that’s ideal for cutting through thick underbrush. You won’t have to worry about constantly replacing string. In our opinion, a gasoline-powered cutter is the way to go and all of the machines we’ve reviewed on this page are gasoline models. There are electric and battery powered options, but they have a reputation for getting bogged down in heavy brush. In many cases, they’re not much better than a traditional string trimmer. There are all kinds of brush cutters options out there. When you get into some heavy duty industrial models you can expect to pay hundreds of dollars. For most homeowners they’re not necessary. If you’re buying a machine for commercial use you may want to consider one of these premium models. The machines reviewed in this article are all priced reasonably and have good reputations. If you’re looking for a good brush cutter for the backyard they’re a good place to start.